Without Facebook, South Africa captain Bongi Msomi's netball career could have gone in a very different direction. In 2015 the now 31-year-old received a Facebook message from then Surrey Storm player-coach Tamsin Greenway. Thinking it was a joke, she ignored it. "Tamsin was asking me to come over to play in England after watching me in the Commonwealth Games in 2014. Msomi went on with her day, but hours later, decided to explore Greenway's social media profile. "I looked through her photos and saw she was an England netball player. I then messaged her back asking if she was serious. She replied 'YES!'" Within months of moving to England, Msomi won the Superleague title with Storm before following Greenway to Wasps in 2017, where they won the title twice more with their new club. Msomi said: "Tamsin had so much respect for what I could do and she coached me to be a better player - she has been a great and important part of my netball career." 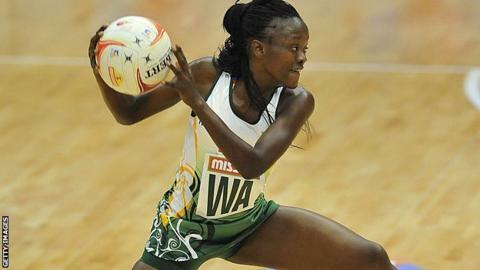 Remarkably, Msomi did not pick up a netball until she was 16. Born in a town on the outskirts of Durban with no running water and the fifth of eight children, sport was not a priority. Moving to England's south east when she was 27 was a culture shock. "Every time I call my mum and sisters, they say 'do you ever think of coming back?' because I'm so happy here and having fun and it's so overwhelming still." Msomi, who says home is "always in my head", is living with a sponsor family who are teaching her to ride a bike and to swim. "I'm hoping by the time I next go home I can do both and I wouldn't have been able to do either if I hadn't come to England." Around the time Msomi moved to Surrey, something special was also happening in her international career, with the arrival of former world champion and Australia head coach Norma Plummer in June 2015 to lead the Proteas. "Until Norma arrived, nothing was competitive in South African netball," Msomi said of her "amazing" coach. "It's been a great improvement since Norma came - she is a legend of the game. "The respect we have for her, her experience and knowledge she has for the game... the respect and trust she has in us has also been phenomenal - you build confidence from that." Plummer has instilled a new "belief" and "winning mentality" into her side. Grassroots netball is limited in Msomi's homeland, especially in comparison to England, where girls have the opportunity to join a club or school team from as young as four. And Msomi discovered her talent for the sport by accident. She was asked to fill in for a school team short of a player. Tenacious and strong-willed and knowing her family may not approve, Msomi borrowed old kit and trainers and took to the court. Within minutes, she was hooked. "It felt like exactly the right time when I started to be a lady and not just a girl," the centre-courter said. "I knew what I could afford and what I could not - I did not have any financial support. "Getting into netball late has been an advantage for me - the best thing that could have happened. "There was not many girls in South Africa playing sport then. But if you look at netball now I would recommend you start as early as you can. The more you practise and the more you grow up with it, the better." Being a late bloomer in the sport is not entirely unusual in South Africa, with Msomi's international team-mate Shadine van der Merwe not starting to play until she was 14. This made the Proteas' victory over Commonwealth champions England in January and forcing extra time in their loss to world number two side New Zealand that little bit more extraordinary. South Africa are ranked fifth in the world, but Msomi believes her side can win a medal at this summer's World Cup in Liverpool. She says she and her team-mates, especially those also based at Superleague clubs, are "inspired" by England's success. "The gold is what we want to achieve but the top four would be a massive step," said Msomi, who has more than 100 caps for her country. "If we can play like we did in the January Quads, anything can happen." Msomi spent a season playing for the Adelaide Thunderbirds in Super Netball before retuning to Wasps for 2019 - her season down under did not go to plan, by her own admission. The Thunderbirds finished the 2018 season winless, and Msomi's court time was limited, yet she refused to let it hinder her experience playing and training in the best league in the world. She set up Bongi Msomi Netball, running coaching clinics for young players with the help of former Australia international Erin Bell. "I've always wanted to help kids - whether it's netball or life skills," she says. "I would have loved to have played more but I am at my peak fitness level because I've been in Australia. "I want to enjoy my netball towards the World Cup so that's why I came back to Wasps."